According to decades of research, there are two fundamental belief systems, also know as “mindsets,” that determine how people respond to struggle, setbacks and failure when pursuing their goals. In one mindset, you’re likely to get discouraged and give up on your goal. In the other, you tend to embrace the struggle, learn from the setbacks and keep moving forward – you persevere. Before I tell you more about these two mindsets, I want to share this inspiring, true story about a boy named Stevie. His mother called him Stevie. He fancied himself a writer. He wrote his first story before he was old enough to shave. His mother liked it; said it was good enough to be in a book. A few years later, he sent one of his stories to a magazine, hoping to get it published. Unlike his mother, they rejected it. Stevie nailed the rejection letter to his bedroom wall and kept writing. By the time he was old enough to drive, he’d replaced the nail with a spike large enough to hold the ream of rejection letters he’d received since the first. Still, he kept writing. Ten years came and went, along with many more rejection letters. Stevie – now a struggling, 26-year-old school teacher with a wife and two children – receives a telegram from Doubleday publishing. They tried to call him on the phone, but Stevie and his wife were too broke at the time to afford telephone service. That was about to change though, because the telegram was not another rejection letter. Doubleday had agreed to publish Stevie’s first novel – a horror story about Carrie White, a teenage girl with telekinetic powers. They paid him a $2500 advance for the book. Not long after, paperback rights to Carrie sold for $400,000, and Stephen King was well on his way to becoming one of the most prolific and successful writers of modern times. 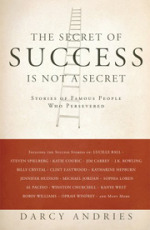 What Ultimately Makes People Successful? I’m always inspired by stories of how successful writers like Stephen King started out. How they struggled for years. How they endured rejection after rejection, failure after failure, but kept moving forward. Kept honing their craft. Kept chasing their dream. J.K. Rowling is another fine example. Depressed, practically broke and living on welfare, she was rejected by a dozen publishers before she finally found one to publish her Harry Potter book series. As you probably know, she’s now a multi-millionaire. Of course, it’s not just famous writers who struggled their way to the top. If you study the background of any successful person in any field, you’ll often see a long road of struggle, setbacks and failure stretching out behind them. Maybe these people were blessed with raw talent, intelligence, luck or other advantages the rest of us lack. Maybe they weren’t. In either case, what ultimately made them successful was their choice to keep learning, keep working and keep moving confidently in the direction of their dreams, no matter how hard it got. What ultimately made them successful was their choice to persevere. As you’re about to see, when you adopt the right mindset, that choice becomes much easier to make. What do you believe about human qualities, such as talent, intelligence and creativity? How about character traits like self-discipline, grit and willpower? With a fixed mindset, you believe traits like these are largely static and predetermined by your genes and upbringing – either you have them or you don’t. 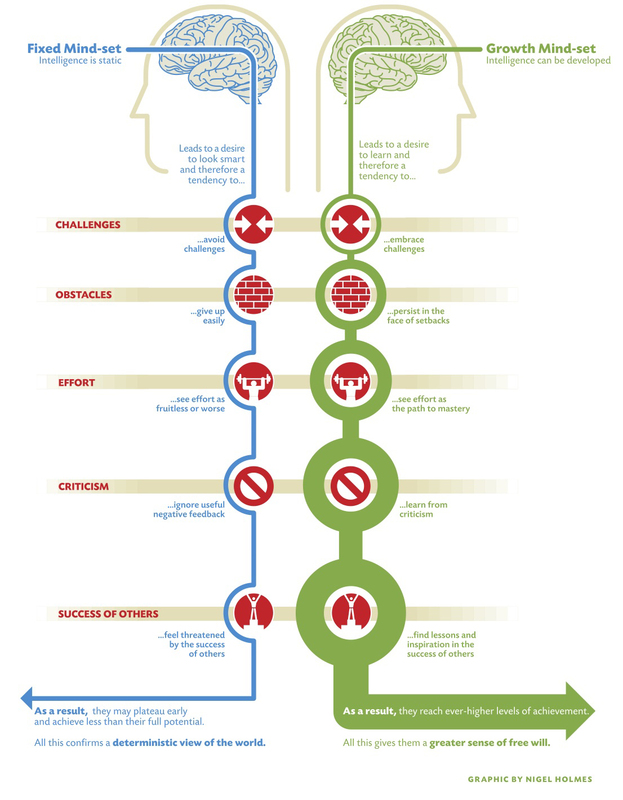 Through the lens of a growth mindset, you see them as malleable skills that you can cultivate and strengthen over the course of your life (science proves this to be true, by the way). This distinction between the fixed mindset and growth mindset emerged from the work of Carol Dweck, Ph.D., and her colleagues. Dr. Dweck, a psychology professor at Stanford University, has spent her career studying motivation and achievement. In her bestselling book, Mindset: The New Psychology of Success, she presents an airtight case that a growth mindset can help strengthen your motivation, even when the going gets tough. 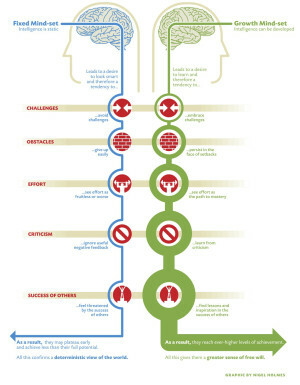 “In a fixed mindset, people believe their basic qualities, like their intelligence or talent, are simply fixed traits. They spend their time documenting their intelligence or talent instead of developing them. They also believe that talent alone creates success; without effort. They’re wrong. “In a growth mindset, people believe that their most basic abilities can be developed through dedication and hard work … This view creates a love of learning and a resilience that is essential for great accomplishment. Virtually all great people have had these qualities. The human mind is a meaning-making machine. Whether you’re aware of it or not, you’re constantly monitoring what’s happening around you, interpreting what it means and deciding what to do about it. This is obviously an important process for your survival, but it’s also the main driver of all your suffering – especially when it’s shaped by the fixed mindset. It’s hard for me to lose weight. It’s healthy to acknowledge your limitations and recognize where you can be doing better in your life. But that’s not what’s happening in the fixed mindset. Remember, the fixed mindset believes that talent and abilities are largely fixed and predetermined – either you have it, or you don’t. If you have what it takes, great. If not, why even bother to try? You might as well give up, and move on to something easier. Obviously, this is not the kind of thinking that helped Stephen King and J.K. Rowling become bestselling authors. It’s not the kind of thinking that generates motivation to persevere when the going gets tough. The growth mindset interprets challenge and failure much differently than the fixed mindset. Remember, the core belief of the growth mindset is that human abilities and talents are malleable skills that you can cultivate and strengthen over the course of your life. The fixed mindset mistakenly views your limitations as permanent. The growth mindset understands they’re just a starting point – guiding stars that tell you where to focus your energy toward personal and professional development. The growth mindset is an antidote to defeatism. It interprets challenge and failure not as a signal to throw in the towel, but as a natural, healthy part of human growth and achievement. This may sound like good ole’ fashioned positive thinking, and maybe it is. The difference is these conclusions are based on 40 years of rigorous, scientific research – hundreds of studies that all say the same thing. If you want to strengthen your motivation, achieve your goals and lead a more fulfilling life, you’re best-served by a growth mindset. As I’ve said many times, success rarely comes easily. Anyone who’s ever reached a level of success or made a change in their life had to overcome challenges, setbacks and short-term failures along the way. Some more than others, I’m sure, but ultimately, they all persevered. They all kept moving forward, regardless of the challenges they faced. You now have a choice regarding how you interpret struggle, setbacks and failure. You can interpret it from a fixed mindset as evidence that you’re somehow not cut out to succeed. Or you can interpret it from a growth mindset as guidance for where to focus your efforts toward personal and professional development. If you want to protect your motivation, and keep moving forward, always make the growth mindset choice. Reading your articles this morning set my mind straight for the road ahead and really lifted my spirit — Thank you SO much Michael for your AWESOME work here and for sharing! Keep it coming! Getting started is the hardest part for me (choices) so I need to start now with exercising (a good OLD habit). I have the growth mindset and wanting to free myself from an addiction as well. Blessings to ALL on each and every journey!!! This has helped me realize I have a fixed mindset. Everything under it describes my way of thinking and behavior. Realizing this is the first step for me to work on myself into developing a growth mind! And for that, thank you Micheal. Great article Michael! I’m actually reading this article as the result of a search regarding blogging. I’m about to embark on this new journey of writing blogs, so I’m doing some research before publishing my first post. Your piece was very helpful, especially in validating my move toward a growth mindset. The fact that I’m even embarking on this journey is more validation for me. Any advice as I embark on this journey will be much appreciated. Thank you very kindly! awesome, I love the truths that are being shared herein. in life it always trickles down to attitude and mindset and not talent, beauty, or aptitude. Thanks for the kind words Maina. Am curious how this relates to the “midlife crises” where older people just get run down despite trying to keep a growth mindset and start to become cynical. What practical advice would you give to someone who struggles to persevere? The second piece of practical advice I can offer is to clarify your question a bit. Are you asking, for example, “why do I often fail to finish things that I start?” If this is the case, maybe quitting is simply a habit for you, as it is for many people (only about 10% of people fulfill their New Years resolutions). When the task gets challenging or boring or starts to feel like drudgery, you hop to something else that may seem easier or more exciting, leaving the previous goal incomplete. You need to create a new habit of finishing things that you start. Make a rule for yourself that you will not start any new projects unless you will finish it. Don’t focus on the outcome, just focus on finishing the project no matter what it takes. You could make a deal with a trusted friend or mentor that you will pay them X amount of money if you do not finish the project (see stickk.com). Or maybe you are asking, “I tend to finish things that I start, but it’s often a struggle, and I want to know how to make it easier.” If this is the case, kudos to you for pushing through the struggle to finish the task. Nobody ever said it would be easy. There’s a great quote from the writer, Henry James, that speaks to this: “Take the word for it of a man who has made his way inch by inch, and does not believe that we’ll wake up to find our work done because we’ve lain all night a-dreaming of it; anything worth doing is devilish hard to do!” I completed a marathon once – a 26.2 mile race – and the last 10 miles were brutal. Every joint in my body ached and begged me to quit, but I just couldn’t do it. I was determined to cross the finish line, even if I had to do it on my hands and knees. This article is really good one to show off why some people are newer steps forward and why some never stops moving forward. Thank you so much for this much needed moment! I truly appreciate this post. Nice one, Michael. I intend to visit often for such insights as this. Please, keep them coming. mind opening and power articles,full of guidance and wisdom.It pushes a person to challenge themselves.Thank you. Hey Michael! Great article…Its just what I needed! I’m a medical aspirant and I have my entrances with 2 months…With soo much of studying to do it really does get tough sometimes..And to make it worse, I’m such a TV addict! I went through that article..Even that was superb!!!! Its all very inspiring. Thanks again for these articles. It really does help a lot! Thanks for sharing this, Michael, and do write more. Some people, like myself, have preserved a basic belief in achieving goals through motivation. The lack of apparent success doesn’t make much difference, because the other option is violence. Any observations, hints, accounts or studies leading towards a better motivation are very welcome. I don’t believe better necessarily means stronger. Looking back, I’ve often stopped half-way towards a goal, because I suddenly realised that the goal itself was not worth the effort (or the fox found the grapes sour?). Yes, I am on the lookout for non-trivial real-life goal or goals. n66.pl (I was born in ’66 [natus ’66] and I live in Nowa Huta, a district of Kraków) – any other services including web creation, social action, home for neighbouring businesses if they choose to be in my domain, etc. Apart from services provided directly by myself (translations/paintings) I intend to create a bundle of other services (one or two of a kind) – local services or services recommended by me. I’d like my clients to be able to communicate between themselves by means of buddy press and post queries using bb press. Sales must reside on a separate installation (networked plug-ins for woo-commerce are insanely expensive), while all the rest will be a multi-network (painting.pl is a network already using a special theme). I’d like to use n66 as an umbrella for all the services and the place to exchange opinions + my personal blog. I would be very grateful for your comments as to the idea itself and some technical hints how to plan things out. I have purchased a VPS and I am in the process of setting it up. It’s important for me to make the right decisions at the initial stages. Thanks for the comment and the kind words, Jakub. I certainly intend to continue writing on similar subjects. Regarding your project, I don’t have any specific ideas for you at this point other than a suggestion to scale it down. It seems you have a lot of different interests, which is great, but the concern is that could lead to a lack of focus. I’d say pick one specific element of the project, fully commit to it, and place all your energy and resources into that. Develop the project, build an audience/customer base, and make it your mission to serve their needs as well as you can. Beyond that, I can’t offer much else as there’s just too much that I DON’T know about you and what you’re all about. And this is not really the place to discuss that in any depth. Great article Michael. It does take a conscious effort to maintain a growth mindset, but it pays off of you are persistent. I found it easier to do this as I got more mature and had stability in my life. Thanks Alex. Great point, and I’ve had a similar experience. I still catch myself approaching things from a fixed mindset. In fact, as I crafted this article, I had to continually remind myself to approach it from a growth mindset perspective.